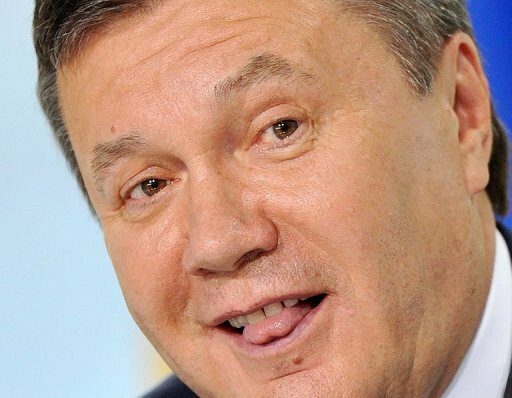 KIEV, Ukraine -- Ukrainian television has quietly dropped a comedy sketch lampooning President Viktor Yanukovych, prompting a new outcry about press freedom under his rule, reports said on Wednesday. The sketch was broadcast on Sunday in the Bolshaya Raznitsa comedy show on Russia's Channel One television. But when the same show was broadcast on Ukraine's ICTV channel, the sketch was conspicuously absent. The seven-minute sketch -- extremely biting by the often flaccid standards of post-Soviet political satire -- shows the newly empowered president seeking to fulfill his dreams inside his presidential office. It is called "Viktor Almighty" in a reference to the 2003 Hollywood film "Bruce Almighty" where an ordinary man who likes complaining about God is given powers to show how hard it is to run the world. In the sketch, Yanukovych uses his powers to order everything from cigars to a top hat through the intercom but ends with his suit covered in post-it notes and the president putting on earphones to block out the demands of the people. His impersonator also perfectly imitates the Ukrainian president's distinctive provincial accent. Opposition MP Mykola Tomenko, the deputy speaker of parliament, said that the sketch had been "censored by the ICTV channel". "Viktor Almighty was taken off the air," was the headline in the daily Segodnia. The Ukrainian channel, considered loyal to the authorities, declined to comment when contacted by AFP. Yanukovych, who came to power in February after defeating the pro-Western champions of the Orange Revolution in elections, has been repeatedly criticised for declining press freedoms under his rule. Earlier this year, a gigantic wreath fell on his head at a memorial ceremony, prompting a hurried cover-up by his staff which was then reversed when media complained. Press freedoms in Ukraine are highly-prized as one of the few tangible benefits of the Orange Revolution that ousted the old order from power in 2004. It remains to be seen why Russian TV made the move to broadcasting a sketch lampooning the Ukrainian president, who is normally seen as a loyal friend of the Kremlin. However while ties improved radically immediately after Yanukovych came to power, there has been frustration in Moscow that integration efforts have slackened somewhat over the past months.